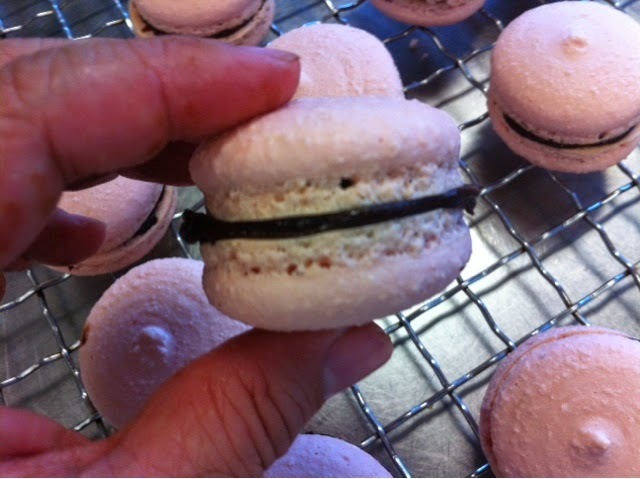 It's interesting how so many people are interested in learning to make macarons. Last year, I wrote on my experience at the Paris International Cooking School on the chocolate macarons. So on Sunday I brought the ones I made at Tafe to church today. These ones in the pic have sunk in, so I was not very pleased about it, but I didn't realise they have a good amount of 'feet'. The ganache seemed to be fairly rich, but not too sweet. So one church mate asked which kind of method I used, and I said we generally use Italian Meringue rather than the French Meringue as it makes the mixture more stable. I read through a few web blogs, and they all mentioned the use of Italian Meringue. I'm not sure if the type of baking paper used affects the outcome though. But that remains to be tested in the near future, I guess? A classmate, Eve mentioned that hers had quite some time to develop the crust, and she used a lot more meringue so hers seemed smoother with less lumps. - It needs to have a smooth shell. Perhaps use more meringue (need to test this theory out). - It needs to have 'feet'.- using Italian Meringue should assist in that. - Letting the macaron rest for at least one hour after piping will help in "crusting" the shell, but that is also dependent on the humidity level as well. - Make sure you sift the dry ingredients. At least twice.